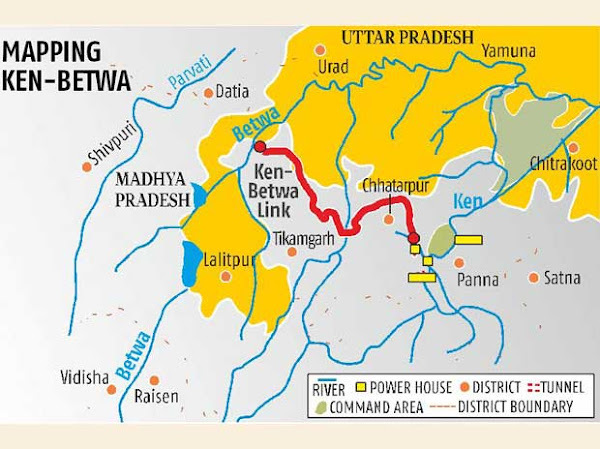 The Forest Advisory Committee of the environment ministry has recommended the interlinking of the Ken and Betwa rivers in Madya Pradesh, and has removed the last major hurdle to the implementation of this Rs 10,000-crore project (first phase) that has been pending for years. The interlinking of the Ken River in Madhya Pradesh with the Betwa in Uttar Pradesh is finally seeing the light of the day. This is a multipurpose project and meant to create additional irrigation potential of 600,000 hectares, provide drinking water to 1.34 million people and produce 60 MW of power. The endorsement of this project, more importantly, sets the tone for similar clearances to many other river-connecting proposals to transfer surplus water from river basins to deficient ones for equitable distribution of water across the country. This is century old idea of a national network of interconnected rivers. Interlinking all Indian rivers is loaded with potential gains, such as additional 35 million hectares irrigation and 34,000 MW of power generation. With this project as water reach to every part of the state, It also has benefits include flood control, navigation, fisheries and domestic water supply. This (Ken-Betwa) project will be the first among the 30 linkages proposed by the water resources ministry under its national water plan. The Godavari and Krishna rivers have already been linked with the Pattiseema scheme in Andhra Pradesh in 2015. The other inter-basin river linkages executed earlier included Sarda-Sahayak, Beas-Sutlej, Kurnool-Cuddapah, Periyar-Vaigai and Telugu Ganga. Hurdles involved in these projects? Apart from the environmental, financial and feasibility impediments, the implementation of projects on such a mammoth scale may pose many situation-specific glitches, including population dislocation, which may be hard to surmount. Besides, building a political consensus to take up inter-state water linkages may not be as easy since water is a state subject. Even in the case of the Ken-Betwa project, the government will need to be watchful of its adverse fallout on the Panna tiger reserve, a part of which is anticipated will be submerged. This bodes ill for some critical animal species such as tigers, vultures and gharial. Though the project sets apart 5 per cent of its budget exclusively for conservation and rehabilitation of this sanctuary, the action plan for this purpose will have to be result-oriented. Water quantity condition in India? India is not an inherently water-short country. Its total annual rainfall of around 120 cm, including 89 cm during the monsoon season, is well above the global average of around 100 cm. If the bulk of this water, especially that falling during the monsoon, can be prevented from running off to the sea, eroding precious top soil in its wake, and can, instead, be distributed fairly, no part of the country will remain water-starved. However, the geological, ecological and environmental aspects of such a massive redistribution of water cannot be disregarded.